Jeff Degraff Innovation Library, 9780692242704, 96pp. 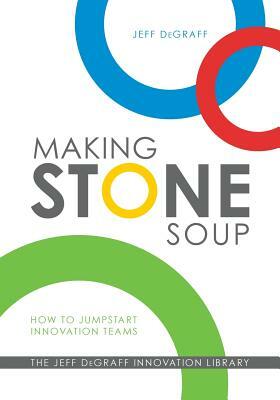 Making Stone Soup is a colorful and entertaining how-to guide for jumpstarting innovation teams. In the classic children's story, Stone Soup, three hungry strangers come to a wary village and set an empty cauldron in the town square. Using only their imagination, cleverness, and ability to improvise, they quickly enlist the skeptical townsfolk one by one until each has contributed a little something to the sumptuous feast. The story is a lesson on how to use a little creativity to transform the ordinary into the extraordinary. Making Stone Soup shares this simple and clear recipe for making collaborative innovation happen in four simple steps: 1. Setting high quality targets 2. Enlisting deep and diverse domain experts 3. Taking multiple shots on goal 4. Learning from experience and experiments Making Stone Soup is short, fun and to the point. It's an excellent guide for anyone launching an innovation team, leading a creative project, or developing a novel solution. It's easy to understand and follow. Making Stone Soup is filled with free resources to help you get started: - A how-to jumpstart innovation video - An innovation leadership assessment - Access to a wide array of articles on innovation Making Stone Soup gives you everything you need to make collaborative innovation happen.